The Bucs brought their pet rock with them to New Orleans on Sunday. But no matter how much they pounded it, they couldn't turn it into a brick. That was the Bucs' objective here - to place another brick in a road that they hope will lead them straight to San Diego, site of Super Bowl XXXVII. Until Sunday, it looked as if that road was going through Tampa, where a 200-pound rock has come to symbolize the Bucs' never say die ``Pound the Rock'' motto. But now, after losing 23-20 to the Saints, there is no telling where that road is headed. Once again it may go through Philadelphia. Or San Francisco or Green Bay. It even could go through New Orleans. The Bucs have to hope that won't be the case. For the Saints appear to have something on them. Their pivotal victory Sunday, which gave new life to New Orleans' hopes of winning the NFC South title, was their second against the Bucs this year. 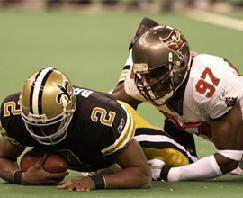 That means that the Saints would win the division title should they finish tied with the Bucs at season's end. And more than anyone they seem to have quarterback Aaron Brooks to thank for that. With two more touchdown passes Sunday, Brooks increased to four the number of touchdown passes he has thrown against the Bucs this year. All the other quarterbacks the Bucs have faced have combined for three. Brooks' two throws into the end zone highlighted a day in which he mostly struggled against the Bucs' defense, completing nine of 25 passes for 155 yards before being forced from the game with an bruised right biceps. That certainly will raise new questions about the Bucs' ability to go deep into the playoffs, which remain strong primarily because of the continued play of their defense. Overall, that unit allowed just 238 yards Sunday, which started off very promisingly. Knowing that the best way to avenge their opening-day loss to the Saints was to get off to a fast start defensively, the Bucs did that thanks to Simeon Rice. Three plays after the Bucs' first offensive series ended with Johnson fumbling the ball away while being sacked at his own 29, Rice began an uncanny stretch in which he racked up three sacks, forced a safety- creating fumble and set an NFL record. The record came on the second of Rice's sacks. In addition to knocking the Saints back 14 yards to the Bucs' 30 - which would prove pivotal - it made Rice the first player in NFL history to record two sacks in five consecutive games. The only thing bigger than the record was what it did to the Saints. Still with a chance to take the early lead in the game, they blew that opportunity when John Carney missed a 48-yard field goal attempt. Rice wasn't finished, though. Two series later he blew by left tackle Kyle Turley and slapped the ball from Saints quarterback Aaron Brooks' hands to create a safety that gave the Bucs a 2-0 lead. Unfazed, the Saints drove 80 yards in 10 plays to take the lead, which stood at 6-2 when Haslett inexplicably decided to go for the two-point conversion - a McAllister run that failed. Struggling to move the ball themselves, the Bucs suddenly put together their longest scoring drive of the year, a 90-yard march that ended with Mike Alstott carrying a Brad Johnson pass 44 yards into the end zone for a 9-6 edge. Aided by a roughing the passer penalty and a 13-yard pass to backup fullback Jameel Cook, the Bucs moved into position to extend their lead late in the first half but failed when Martin Gramatica's kick bounded off the right upright. It was the seventh time this year that Gramatica has missed a field goal try. Prior to this season, Gramatica had never missed more than six field goal attempts in a single season. That miss would prove costly almost as soon as the two teams returned to the field for the second half. With a 52-yard pass to Horn proving to be the biggest blow, the Saints went on a quick 56-yard drive that would net them a 13-9 lead. A series of fumbles and some poor coverage on kicks set the stage for the next scoring drive, this one resulting in the Saints increasing their lead to 20-9 on a 14-yard pass from Brooks to Horn, who slipped behind Brian Kelly near the end zone. An exchange of field goals made it 23-12, but the Bucs bounced back and moved to within a field goal of a tie with 2:49 left when they produced eight points on 1-yard touchdown pass to Keenan McCardell and a two-point conversion pass to Keyshawn Johnson.